Come meet this fascinating gardener and hosta breeder through his lush shade garden. Goodwin’s garden winds through a series of his own hybrids. Hosta ‘Spartan Arrow’ has 9-inch, dark green foliage that is very wavy and dense, with a sharp lancelike shape. It also has pale purple flowers on 20-inch scapes in midsummer. It is the spear shape that makes this hosta distinct. Hosta ‘Hot Lips’ (bottom right) and a bit of spring bamboo accents the front of the large rock (right). I jumped at the chance to interview one of the “masters,” so when Randy Goodwin walked inside from his garden and greeted me, I thrust my hand forward to clasp his. I wanted to shake hands gardener-to-gardener, before he could wash the soil of wisdom from his palm. Like a wide-eyed music groupie who gets a personal interview and a seat in the front row of a sold-out concert, I asked Randy Goodwin to name some of his favorite creations. 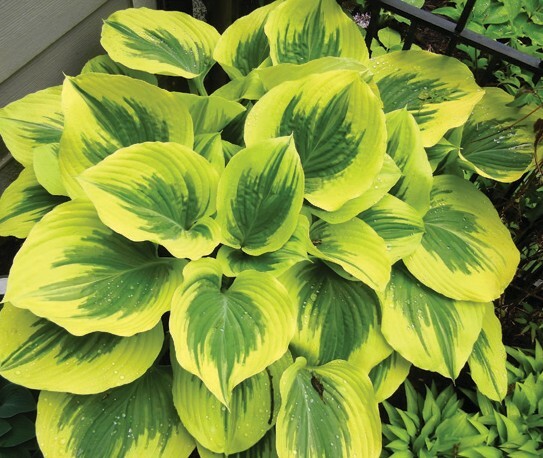 Goodwin is one of only 20 hosta hybridizers in the U. S. — one of the many from Indiana. “We have good growing conditions,” he explained. Walking through their showroom-decorated home, Goodwin’s wife Susie asked, “Do you know how he comes up with names for his new hostas? Paint store colors!” she answered. Left: Goodwin has an eye for unique specimen plants, including dwarf ginkgoes (Ginkgo biloba). Pictured are Cornus kousa ‘Wolf Eyes’ (light green, white interior variegated foliage) also known as a Chinese dogwood, which puts on a six-week ivory white “floral show” with its bracts in the spring. The dwarf english oak in the front is Quercus robur ‘General Pulaski’ with crinkled dark green leaves. Named for an officer in the American civil war, this upright, deciduous tree will grow to 6 feet tall in 10 years and be only 1½ feet wide. 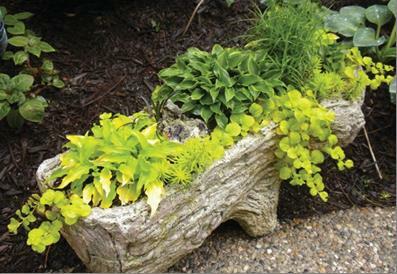 Above: Goodwin’s mini-garden won the 2012 National Hosta Show’s Trough Division. 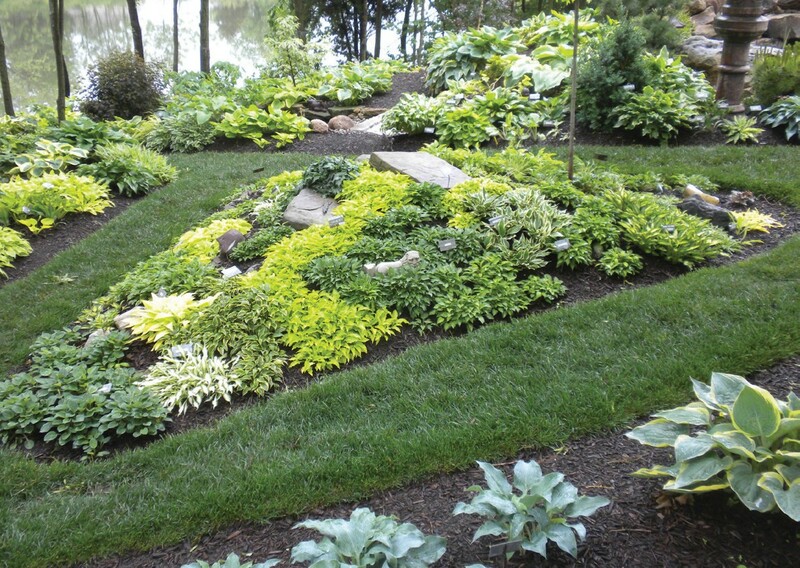 Randy’s landscaping has earned him the moniker “The Man who Paints with Hostas.” He suggests planting hostas in various shapes, shades and groupings to help the eye follow the different cultivars. 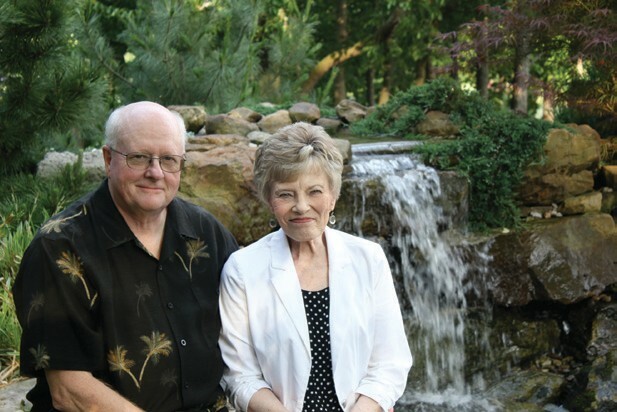 Left: Randy and Susie Goodwin sit in front of their Green County stone water feature. The hundreds of hostas in Randy Goodwin’s garden whisper his autobiography.Goodwin has hybridized and registered 80 different hostas over the past 25 years, 40 have been introduced and he is currently watching another hundred to see if they are distinct.Goodwin explains that it takes seven years to produce a plant that is worthy to be on the market. I asked him how he got into hybridizing hostas, which are the number-one shade perennial in America. He responded, “The more you get into something, the more avenues that are opened up — when I saw the prices people were getting for hostas … I guess I’m a mercantilist at heart. While working as a fifth-grade teacher in Speedway School Corporation in Indianapolis, Goodwin first became interested in the Hosta genus when living in Pike Township, after building a house on a wooded lot. After a trip to Soules Garden in 1987, “I thought I was in the middle of a Brazilian rain forest — after that day I was hooked. That same year Marge (Soules) went to the (American Hosta Society) national convention and when she returned she informed our small group of seven original Indianapolis Hosta Society members that we were going to host a Hosta National Convention in Indianapolis — which we did in 1989, 1997 and 2007. Although retired from his classroom of fifth-graders since 2001, Goodwin continues to teach, explaining that hostas have been grown in gardens in East Asia for centuries. 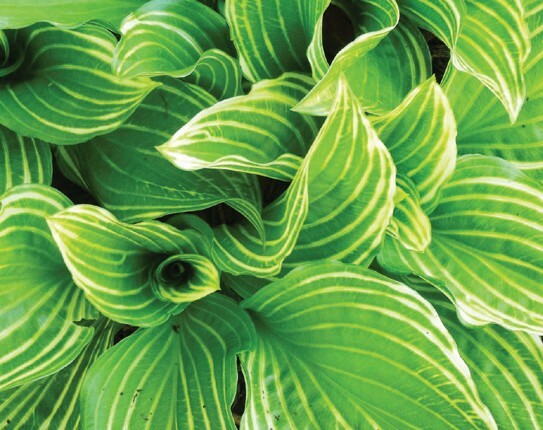 The American Hosta Society reports that Chinese documents mention hostas as early as the Han Dynasty 206 B.C. through 220 A.D., and in Japan they show up in scripts preceding the Nara period beginning in 710 A.D. By 1830, hostas were imported first in Europe, reaching North America just a few years later. The American Hosta Society was initiated in 1968. Goodwin noted vast changes were seen in American hosta growers when hybridization began around 1978 — beginning with about 25 species, there are now well over 5,000 cultivars. A Master Leaf Show Judge and chairman for the three- leveled award system of the American Hosta Society Benedict Garden Performance Medal, Goodwin enjoys displaying his leaves at hosta shows. 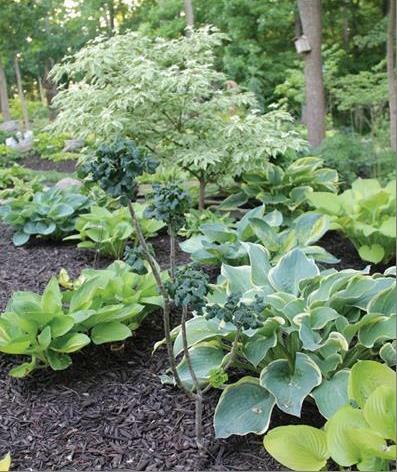 Five years ago, Goodwin and his wife, Susie, moved from Indianapolis to Zionsville — with their award-winning hostas, carefully watering, potting and replanting more than 1,200 plants. 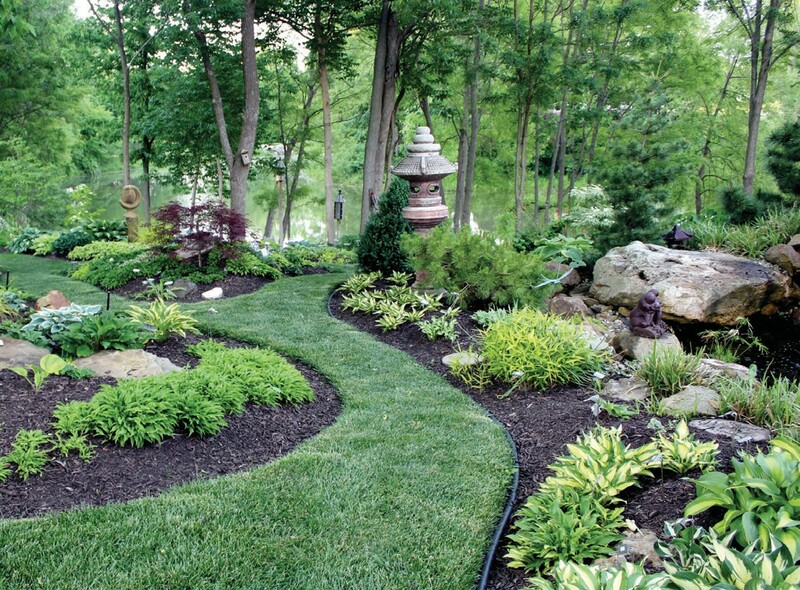 He estimated that he now has about 500 different culti- vars represented in his garden. “I’m like Will Rogers, I’ve never met a hosta I didn’t like,” Goodwin added. 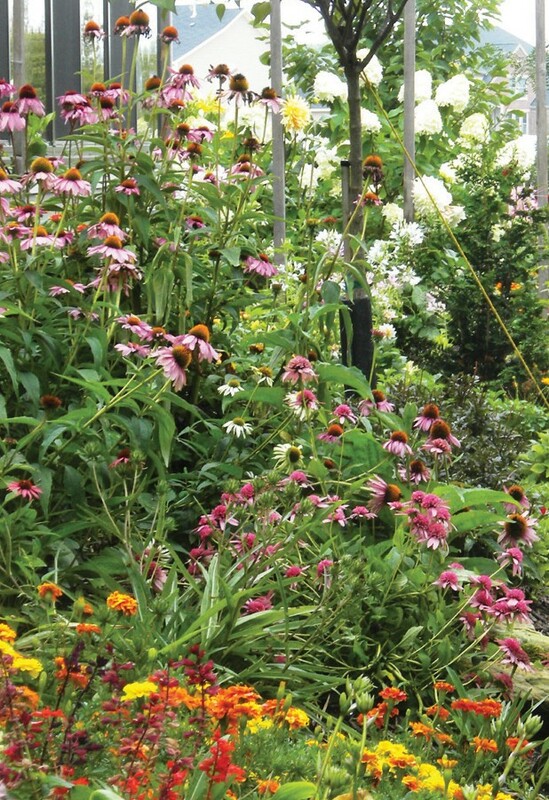 Goodwin’s garden changes annually, but always includes a myriad of color and interesting specimens.